After the first oil crisis (OPEC oil embargo) in 1973 the Danish Electricity utilities and the Danish government wanted, as fast as possible, to build nuclear power stations in Denmark. OOA was the "No thanks" answer to that wish. In the Spring of 1974 a seed was planted, which would grow and turn into one of Denmark's most tenacious grassroots movements. It was named OOA (Organisation for Information on Nuclear Power). Since then there were anti-nuclear marches from Stevns and Gylling Næs (2 out of 15 possible locations reserved for the construction of nuclear power stations). Hundreds of thousands of smiling suns have in the form of badges and stickers said firmly, but friendly: "NUCLEAR POWER? - NO THANKS". The ikon came into existence on 1st May 1975, and has become a registered trademark. 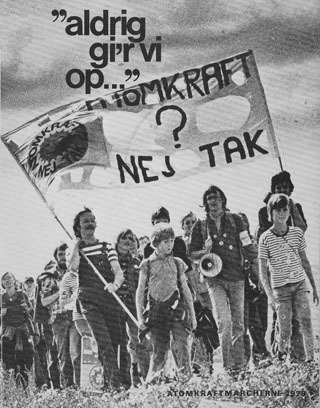 Leaflets to the Danish people, "Denmark without nuclear power", distributed by volunteers, were handed through the letterboxes of every Danish home in the Winter of 1979/80. There were marches against Barsebäck, the Swedish nuclear power station situated only 20 km from Copenhagen, the Danish capital. Such activities have characterized the OOA as a popular and effective movement being independent of party politics, instrumental in increasing the opposition to nuclear power so that we do not have nuclear power stations in Denmark today. * the drawing up of a long-term energy policy, being socially and ecologically justifiable. The OOA was registered as an organization. The OOA was organised as a grassroots movement with local groups and contact persons all over the country, regional offices and a secretariate at Copenhagen with a few paid staff. There were two-four national meetings every year. These national meetings constituted the supreme authority of the OOA. The work of the OOA was dependent on voluntary work by hundreds of activists and upon economic contributions from many individuals. HOW DID THE OOA WORK? Through the publication of leaflets, preparation of documentation materials, direct, non-violent actions, exhibitions, lectures, hearings, reader's letters, distribution of information material, etc. -– The OOA emphasized a broad, popular information on energy and environmental questions. The OOA had from the very beginning emphasized the establishment and the running of a comprehensive public library on energy and environmental problems. This library embraced some 18,000 Danish and foreign books, documents, reports and pamphlets, including a big selection of magazines from all over the world. Bryrup 1975 - The incubation of the Organisation for Renewable Energy OVE. At the nationwide meeting for OOA activists February 1st. to 2nd. 1975 at Katrinedal Youth Hostel, at Bryrup, Jutland, it became evident, that an organisation, concentrating on the alternatives to nuclear power, would be important. Lars Albertsen proposed a positive Danish word for the alternatives : "Vedvarende energi" or sustainable energy. It was proposed to build up a new organistation. Many former OOA activists became activists in the new organisation, that was presented November 6th 1975: OVE (The Organisation for renewable energy). Lars Abertsen became one of the key players in building and running OVE in the early years. Thus the OOA gave birth to an organisation, that later was able to create a network between activists and selfbuilders of for example wind turbines. The basis of the Danish wind turbine industry was created at Katrinedal Youth hostel - February 1975. Energy Gathering at Himmelbjerget on May 15th 1978 arranged by OOA. See photos from the open air meeting, as well as the invitation and programme for the event in the Slide show. 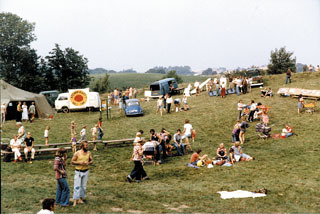 Energy Gathering at Frøbjerg Baunehøj, Funen on September 2nd 1978 arranged by OOA. 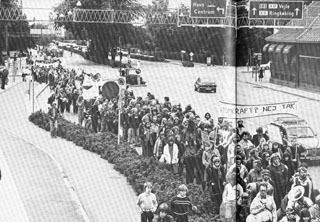 On August 28th 1978 the OOA organised a spectacular march from Gylling Næs to Århus . Gylling Næs was the first site, on which ELSAM was planning to build a Nuclear Power plant in the near future. Arriving in central Århus the crowd listened to speaches. A similar march in bigger numbers was held the same days from Stevns (Another site proposed for a Nuclear facility) to Copenhagen. March proceeding through central Århus. WHAT HAPPENED TO THE OOA? After the Danish parliament in 1985 decided against construction of nuclear power plants in Denmark, the massive support of the OOA weakened. Larger campaigns were organised after the Chernobyl disaster in 1986. Other campaigns focused on shifting from coal to wind energy for power generation. When the Swedish government in November 1999 finally decided to closed down the Barsebäck nuclear reactor 1 the remaining activits in the OOA decided to prepare for closing down the OOA as well. With a big party OOA activists and many friends om 31st May 2000 celebrated the victory against nuclear power in Denmark and left it to a handfull enevironmental organisation to ensure that Danish energy politics would move towards renewable energy and there would be no come back for nuclear power. The Smiling Sun Logo already by 1977 worldwide had become the most common symbol for the struggle aginst nuclear power. It was translated into almost 50 languages and has still its own website - a link can be found on the Link page. More information on books, posters etc. by the OOA will be added later in 2009 !